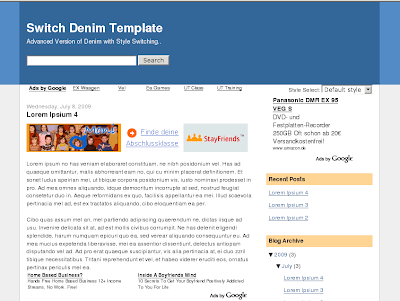 The Denim template is a widely popular template which one of the default blogger templates. The main speciality of this template is that it doesn't have any images but still it looks sleek and professional.. No images means that your site will load much faster. Here i am presenting to you an advanced version of the denim template.This Template has multiple styles(It is more like multiple templates within the same template). Your blog readers can change the blog template from a drop down menu.. This Template is widgetified and comes with the following integrated features. 1.It has a built in label cloud which matches the switch styles..
3.It also has integrated adsense and analytics. 4.It also comes with a recent posts widget. 2.Now create your website profile. 3.In google analytics home page all of your sites will be displayed..
5.This is the Tracking code for analytics.. If you don't want the adsense integration,just leave the adsense pubid field as blank. The Template has 5 different styles.So it is more like a 5 in 1 template. I would love to get your feedbacks.. If you are reading this in a feed reader,the template generator wont be displayed so please visit the actual post..
After download how to install? .xml file. Please help me. Oh i found how to do it. But it will delete my current widgets. How can i install the template without losing my effort made on previous template?